How can the love of animals translate into a career? In this engaging collection of interviews, activities, and advice, Willow Ann Sirch explores more than 30 careers with animals of all kinds. 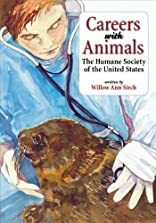 Organized by vocation groups such as jobs in animals shelters, veterinary medicine, wildlife rescue, and obedience training, the author addresses the young reader in a frank, conversational manner. From saving dogs who have swallowed antifreeze, to finding foster homes for abandoned llamas, to teaching sign language to chimpanzees, this book connects a love for animals into solid thinking about future careers.